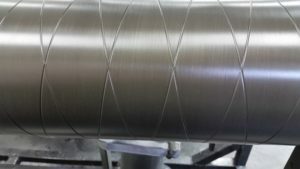 If you are looking for a protective surface coating for your aluminum, this is the process you are looking for. With a 60-70 Rc surface finish, you can expect this coating to outlast the competition. Our Hardcoat line uses the latest technology to give a pore structure so dense, that even your mother would have a hard time damaging it on the stove while making your dinner. All kidding aside, we adhere to the Mil-C-8625f standard while processing your parts. With the hardcoat process, your parts are electrical insulated. Please remember, you can expect to see growth of .0016″-.0022″ overall on most surfaces. It can be dialed back to fit your needs, call one of our sales professionals for more specifics and your needs.